If this bizarre little campaign performance of Senator Joe Biden in Pennsylvania is anything to go by, it's going to be a dilly. She'll more than hold her own. "I tell you MAN. I always liked Barackkk. But I LO-O-OVE her!" Don't you love how Senator Obama edges his wife away as if to protect her, and both MO and BO look half-undone by giggles? Usually, I don't post these kinds of snarky attacks at the other side. I'm content to enthuse about the positive sides of ours. But after the horrific attempted smears I have read online about Governor Palin, which I will merely refer to in passing, my patience ran out just now. A month ago, I encountered a lady at my local South Florida coffeeshop, whose family were looking for construction jobs in our area. Originally from Gainesville, she had one of those excessively lilting Southern accents which either enchant you or distract you (the former, for me). I have this trick with people. I like to flesh out their opinions by gently directing the conversation. It wasn't long before we got to the topic of politics. "I was raised to believe white people and black people shouldn't date", she proclaims. "Oh? 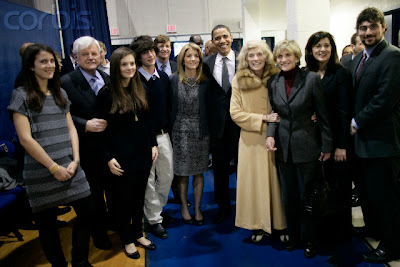 Like Barack Obama's parents?" "Barack Obama? No, I mean my daughter." (Laugh) "I see. But you are not comfortable with him?" "Oh no, ma'am, as long as he fixes the economy, I don't care. We're suffering real bad up there." Before I have a chance to prod, she drops this bombshell (well, another one). "I just don't want a woman to be President. I don't want a woman making decisions with the menopause." At this point, I am caught so off-guard, that I give her a tinkling laugh back, neither aggressive or derisive, but full of genuine surprise. We part ways cordially. I am not a judgemental person, and I'm tired of Americans being so PC, that we've lost the ability to TALK to each other honestly. I never want to live in that America. But our conversation has stuck in my mind since then. Because as you can see, we were talking about Senator Hillary Rodham Clinton. Hillary. It was Hillary then, or no one. But thanks to my fellow bloggers, JSU, Ruth Anne Adams and Simon Dodd, I had this little name floating around my brain since May. "Governor Sarah Palin of Alaska". Even then she seemed the remotest of long shots for the Republican ticket, long ago settled atop, even as the Democratic one still raged white hot. Because of this indecision, the national attention was firmly on the Obama-Hillary saga, and some little nobody Governor from Alaska wasn't about to deviate anyone's attention to her chances as VP. Besides, who could take her seriously? There were many many men in the queue ahead of her. The strongest was ex-Governor Mitt Romney of Massachussetts, but also Governor Tim Pawlenty of Minnesota. Governor Hailey Barbour of Mississippi. Even the barely constitutionally eligible Govenor of Louisiana, but highly appealing, Bobby Jindal, was named ahead of her in the Veep stakes. Senator John S. McCain III had a virtual plethora of choices, people thought. The bench seemed deep. All my life, I've laughed at liberals because of their identity politics affectation. To reduce a choice to something which I consider so meaningless as a skin shade, or a different set of chromosomes, instead of a person's leadership skills or political acumen, seemed so alien to me, as to be almost deranged. I was sure I could never be one of those "We WILL have a black President! ", "I WANT a woman in the White House!" people. But a funny thing happened on the way to the self-awareness forum. I realised I was becoming more and more interested in this creature. See, Sarah Palin does that to people. She did it to Adam Brickley, for example, who not soon after her inauguration as Governor, launched a blog called "Draft Sarah Palin for Vice-President". We're talking February 2007. It was in February 2008 that my blogger colleague, Benning, wrote up a post about her. I'm telling you, she does that to people. "Idaho-born, blue-collar family, dad high school teacher and sports coach, Catholic-schooled, NRA member, sportscaster, basketball point guard, nickname Barracuda, union husband with native Alaskan blood, high school sweetheart, fisherman, steel worker, dog musher, mother of 5, pro-Lifer who decided not to abort her Down Syndrome baby boy, son in Iraq, executive experience, local, gubernatorial." No where do you see the one word that most liberals would use for her instead. It didn't matter to me. I was enchanted, entranced, intrigued by her details and credentials, not just the happenstance of her gender. For it was in May that I thought if this woman had been a Democrat, and there had been no Hillary, the Democrats would've snapped her up immediately. Except of course, they would never do that. Woman she was, but her personal ideology is alien to them. She is far too folksy, at that. Somewhere along the line, they thought only a woman whose face was instantly recognisable to the masses, whose Senatorial job hailed from the most elite State and city in the Union, whose husband was an ex-President, only she was worthy of consideration for a seat with the Big Boys in D.C., even if the seat is on the second tier. Besides, everyone knows that black man trumps white or black woman -- in identity politics, anyway. 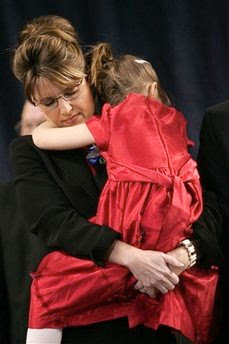 So during the time of the most rivetting presidential campaign in American history (we can now say with utter confidence), this ex-beauty queen from Wasilla, Alaska, who insisted on being flown back on an Alaskan Airlines plane from a Texas Governor's Conference, and though in acute labour pains, made sure her baby was born in her home state, this Sarah Palin was snubbed by Democrats and many Republicans alike. John McCain had met her in February. Once. Maybe to a person like Barack Obama, who hasn't been able to see leadership abilities in action, being surrounded by such worthies as Ayers, Rezko and Rev. Wright, he might have needed more than one meeting to vet this woman. But John McCain had been surrounded by leaders since birth. From that 4-star Admiral grandpa, to that 4-star Admiral pop, from Ronald Reagan, to the entire Senate, to every President since Nixon, countless world figures, and a galaxy of Naval personnel in between, you can bet John McCain can size up a person real fast. That meeting must've lingered in his mind, because I tell you, this Sarah Palin does that to people. She sticks in your mind. Reason? She's political GOLD. A meme that is only being pushed because aging Boomer journalists see their colleagues dropping like flies around them (RIP Tim Russert and Tony Snow) and an American public which expects the world to be Botoxed. Both these sets of people see McCain as Methuselah. He's ancient! 72 years-old, with two bouts of cancer! Never mind that his 98 year-old mother, Roberta, is still alive and getting speeding tickets. The man is obviously one tough debate question away from a massive coronary. Oh, Pope Benedict XVI? 83. One stroke. Elizabeth II? 82. Failing vision, osteoporosis. Two incredibly spry and mentally fit people with full schedules, who will probably bury various reporters, way before their own demise. Yes, world. The aged still have a role to play even in the highest positions of power, whether you like it or not -- just ask Robert Mugabe (84). But didn't the Republicans make a big song and dance about Senator Barack Obama's inexperience? I hate to break it to you, but when you head a ticket, instead of buttress it, you will receive more scrutiny. What life and death decisions, the kind of executive decisions a military commander or Governor are prepared to make, has Senator Obama made...ever? As State Senator, and "activist". We should vote for him why, exactly? Because of an aura of rock stardom, that other Boomer affectation? I am not one of those who dismiss him or discount his talents. He clearly brings a sense of destiny, and self-respect to the table. I like that. I would like it more if he weren't so liberal and snide about his fellow Americans. It would also help if he could give definitive answers without nuances about the questions of the day, because that's what distinguishes a person with character. When you have principles, you don't need laws. In giving convoluted answers in the Saddleback Forum, instead of dazzling, he seemed to contort himself intellectually just in case he offended any potential voters. He seemed helpless, and I was left hopeless I would ever be comfortable with a possible President Obama. 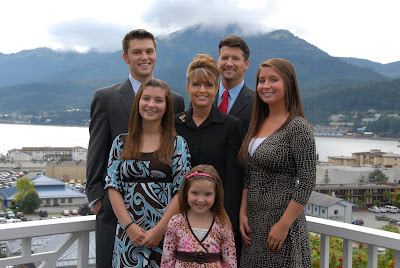 Think back to my original litany of adjectives above about Governor Palin. Though no one can claim deep insight into her philosophy of governance, by her associations and actions I can tell a lot about her. She may yet disappoint me. I am prepared for this. Some people are already pushing the story that she's a Creationist. This would disappoint me. But the story came about like this -- when asked during the gubernatorial debate if Creationism should be taught alongside Evolution, she replied yes. She was the only one of the candidates that did, and she effectively parlayed a politically savvy answer, into an unique position. But in the 2 years since she's been Governor, she's backed away from the matter. She's no Creationist any more than someone who proposes alternative fuels instead of gasoline, is automatically proposing to scrap gasoline completely. You see, the tom-toms are beating already, trying to find a "no-go" topic with which to cudgel her nascent candidacy. Instead, it is I who am looking very closely at Senator Obama, and his various supporters in the national media. I think they are in a very difficult position, vis-à-vis destroying her, and being seen as gender-biased...again. Women are watching Senator Obama, and MSNBC, and Daily Kos, and countless liberal media outlets who did a number on Hillary Clinton. Once, and you might be able to say it was not because she was a woman, but because she was, well, you know, Hillary. 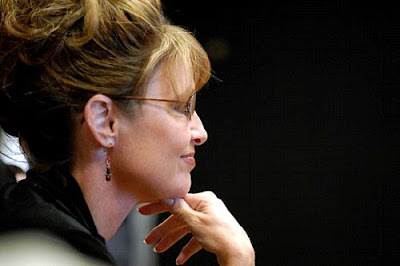 But do it twice in the form of Governor Palin, with the nutcracker jokes, with the beauty queen pageant remarks, with the haughty dismissal of her brain matter, and there will be few feminists unable to ignore the simple fact that their side is as sexist as they thought conservatives were. Her candidacy is something surely not counted on by Senator Obama and his staff, else they would never have gone after Hillary Clinton the way they did, and allowed others to do so as well. And this is where this pick transforms itself from surprising, to genius. 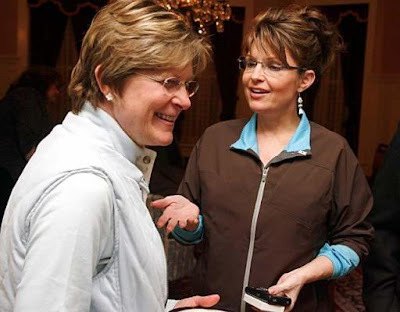 Senators Obama and Biden will have to contort themselves yet again, prisoner of their identity politics, whereas Governor Palin is an escapee of them. The brutal truth is, she didn't need Democrats to get ahead. She was a Republican, sought out by a maverick politician who until now was seen as a dubious member of his Party. She didn't need to "earn her dues" as a feminist, either. He might've elevated her due to that litany of qualities which captivated him, and sensed a tougher cookie than others in Upper East Side salons can decode, but she was a woman of substance and merit on her own terms. Both Senator Obama and Governor Palin are children born in the 1960s. They probably share very similar generational cues. One has a chasm for a background. The other is as American as apple pie. They are both vying for very different positions, on very different platforms. Yet, one gets the sense people are discounting both Senators Biden and McCain, and comparing the two directly. In fact, there are two actors not present in this drama, whose spectres nevertheless haunt our stage: George W. Bush, and Hillary Clinton. 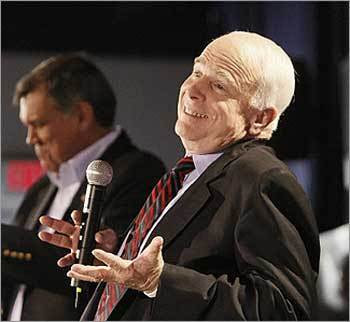 During all these few days left until November 4, 2008, the two most prominent individuals which defined two decades of American politics will be missing. But most people will not be satisfied until they can find some Dubya in Sarah Palin, as well as some Hillary. For those who cannot let go of the ghosts of the past, they are unable to see that for once, fate has dealt them a completely unknown hand. And in their anger in thinking they got a weak hand, they are unable to use their talents to play it. See, Sarah Palin does that to people. And therein lies the wisdom of this choice. As you may know, I've started working out in a gym at least 3 or 4 times a week. This week has wrecked havoc, because of the dread DNC, and I fear more of the same for the RNC. But maybe Governor Palin might just help me out. I think I could make her my workout buddy (seeing as how my real workout buddy, my mother, has pulled out twice already). Why should McCain hog her as RUNNING mate? Ahem, sorry. Now, I love running, but sometimes I lose focus. 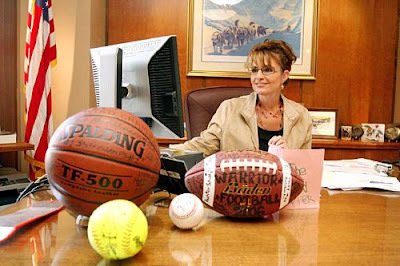 Not so with Governor Palin, whose eldest son was called Track by her husband, because he was born during that sport's season. Remember, folks. She is a marathoner and athlete in Alaska not Central Park West. Those midnight runs she'll talk about below -- in the dead cold of winter. God, who is this lady? Superwoman? "Conventional running is my sanity," Gov. Palin says. Having recently given birth to her fifth child, the governor is trying to get back to her old workout routine. She was running 7 to 10 miles almost every day but switched to aerobics classes at her gym when she became pregnant. She has worked her way back up to running three miles every other day. "My family and I eat a healthy diet heavy in wild Alaskan seafood, moose, caribou and fresh fruit," she says. "I guess my biggest pitfall is breakfast. I know it's the most important meal of the day but I still haven't bought into it. I hate to admit it, but a skinny white-chocolate mocha is my staple in the morning." "My ideal fantasy is to be running on a hot dusty road just wearing running shorts and some kind of top that wicks away sweat. But in reality I'm running in 20-below temperatures, so I wear layers of fleece and always a good outdoor waterproof trail shoe. Right now I've been running in Nike Air Structure Triax. And I always wear sunglasses. My kids tell me to put them on so I don't freak people out when they see me with a goofy hairdo and no makeup." "I'm thinking about my next speech. I usually write my best speeches and letters [in my head] while out running. That is my inspired time." "Nothing. I just drink water." "Being pregnant every few years. If I get lazy and go weeks or months without exercising it's not because of circumstances but because I'm being less disciplined. Shame on me." P.S. : I'm getting those Nikes! The clogs...well, that's another story. ...I like how she didn't buy a new black dress for her Dayton presentation. ...I like how she speaks extemporaneously without teleprompter, or looks like she does. ...I like her long, elongated Midwestern vowels, especially when she says "still" for steel. ...I like that her childhood nickname was barracuda. So was mine. ...I like that she's from Alaska, and Obama is from Hawaii, the two last States in the Union. ...I like the way her husband looks proud as all get out of her. ...I like that she and her dad used to hunt moose when she was a kid. ...I like how she prefers to be referred to as a commercial fisherman, and not Beauty Pageant queen. ...I like that no one in Washington knows what to do with her. ...I like how she drives liberals crazy. ...I like how McCain made me feel when he picked her, after crying on Thursday night. ...I like her son Track serving in Iraq. God bless him. ...I like that she's a woman. When Senator Obama went to Germany, he didn't pay a visit to Landstuhl Medical Centre, where servicemen and women are treated for injuries in the line of duty. But Governor Palin didn't make that mistake. 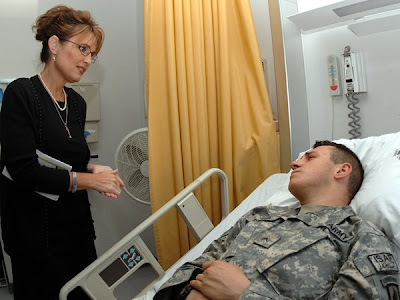 Here she is in 2007 speaking to Army Pvt. James Pattison. She can more than take care of herself. Here is she is at a Newsweek interview, parrying questions about feminism and her life as Governor. If you haven't seen it, do. It's outstanding. UPDATE: Ron has an amazing treasure trove of photos, in his own blogpost on Gov. Sarah Palin. Viking? Yes we can! Governor Sarah Palin of Alaska electrifying the crowd at Dayton, Ohio. She graciously mentions the lady politicians who came before her. Simon's and Ruth Anne's Bogglefied "Calm in Panic" video now looks visionary. I will have many more comments about this historical day in American political history, later. Is This The Face Of McCain's Running Mate? Scottish comedian and late night host, Craig Ferguson, is what we call back home, a top man. And the Great State of Alaska decided to recognise his efforts to be naturalised a year ago, when Governor Sarah Palin made him an honourary citizen of her State. Look at her closely below. 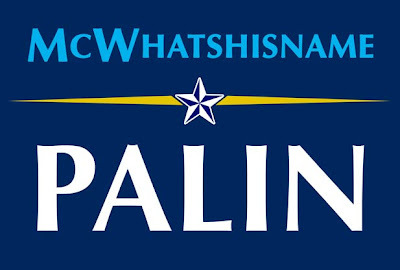 Did we just see Senator John McCain's running mate, as Vice-President? I, for one, hope so. UPDATE 9:18 AM EST: Both CNN and NBC confirm, according to their sources, that Govenor Tim Pawlenty is OUT of contention. NBC confirm it's not ex-Governor Mitt Romney either. 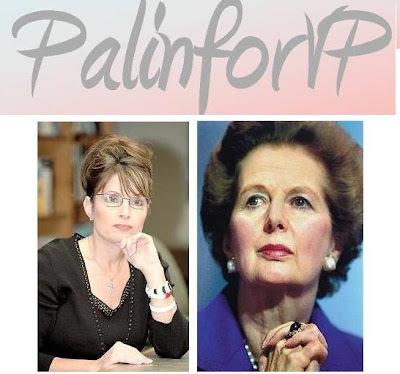 Palin now looks a certainty. You want a game changer? You got it. UPDATE: Heh. I wish she were another Maggie. VIA Internet Ronin: The image of the day. Mother Palin. Senator John McCain was in The Wedding Crashers. Actress (yes, that is a woman) Kathryn Joosten was also in The Wedding Crashers. 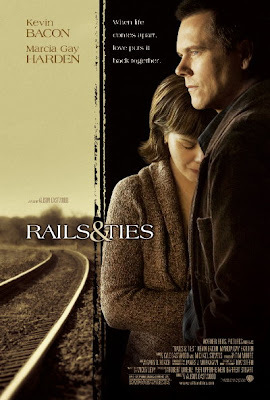 Kathryn Joosten starred in 2007's Rail And Ties. 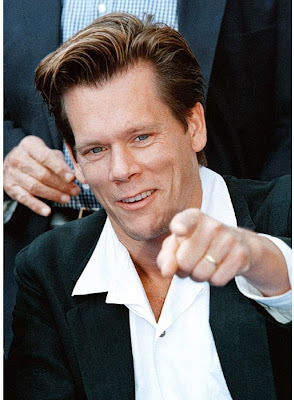 Whose leading man was KEVIN BACON! McCain's Bacon Number is 2. How about John McCain was on "24" starring Kieffer Sutherland and Kieffer Sutherland was in "Flatliners" with Kevin Bacon? 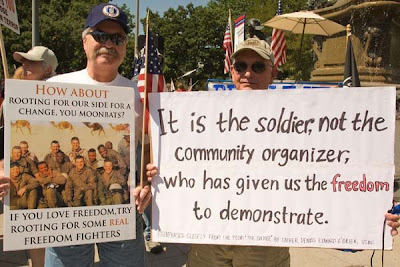 "It is the soldier, not the community organizer, who has given us the freedom to demonstrate." Aimed towards the "Recreate 68" protesters in Denver during the DNC, but could refer almost too poignantly to John McCain versus Barack Obama. Did anyone else gasp when they heard Senator Clinton say, during her recent DNC speech, "Senator McCain is not only a colleague, but my friend." You could hear the air sucked out of the entire assembly. And you'll further note that she didn't once call Senator Obama, "my friend". Tonight, Hillary Clinton raised her some McCain. Not to mention herself, obviously. You look at the Obama/Biden ticket and shake your head, wondering how on earth the Democrats took a sure thing in Hillary Clinton to the White House, and got stuck with those two instead. What a beautiful family the Schlossbergs are. Caroline Kennedy didn't intone the best of speeches today, during the slightly down-beat Night 1 of the DNC in Denver, but her sincerity and warmth for her uncle Ted was extremely moving. I can only hope her children were paying attention to their mother, because that's how you represent, in the best sense of the word. "I would have to think that a bumper sticker that said 'Obama/The Other Edwards' might have been a bit difficult." Heh. That would've been dicey after the John Edwards' mistress scandal, wouldn't it? Though Team Obama didn't even give Senator Clinton the courtesy of an interview, Congressman Edwards says that the vetting process is much deeper than any of us can imagine. "Obama asked if it would be OK to start a formal vetting process. “They look at every thing. . .and even check whether our children have any kinds of things they should not have on Facebook,” Edwards said." The kids' Facebook entries! You know, that's pretty good. It's almost Republican in thoroughness. 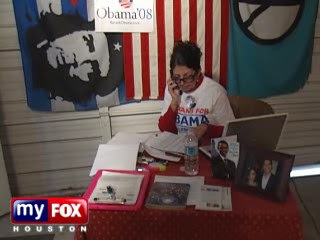 Thumbs up, Team Obama. I'm not sure I'll be blogging the DNC this week, much, as I'm still more or less on August sabbatical. I'm light blogging until mid-September. Now that the Beijing Olympics of 2008 are over, the allegorical baton has been handed to my hometown, London. This is going to be a disaster, isn't it? I mean, who are we kidding?? Sure, we British put sport on the map in the 1800s, and practically dragged human beings into shorts, plus-fours, and those lithsome swimsuits, but we looked awful doing it. Simply content to get the ball rolling, where our more athletic cousins, the Americans, pioneered the cut-throat competitive culture, we have bungled along, cheerfully spectating at events our forebears founded, rather than participating in them. That the 2008 Olympics were the most successful Olympics EVER for Team GB, says a lot. One had to go back to 1908, a full century before, to find anything as remotely golden in terms of medals. Just checking the daily standings, was enough to make a Briton boggle. We finished a vertiginous fourth behind those Olympic juggernauts, China, the USA, and Russia. Fourth! As a child, I remember our country limping back from this or that Olympics with a solitary gold in our coffer. Ex-Olympian Princess Anne could barely hold her head up, on her return. But instead of pelting past Team GBs with tomatoes as they arrived at Heathrow, we hunkered down and allowed mousey John Major to set up a lottery, which allowed the bettering of British sport. Are we thus seeing cause-and-effect in the 2008 Olympics? Perhaps. 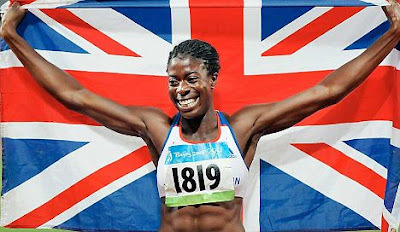 So how is Great Britain going to approach the 2012 version? With heads held high, and a Usain Bolt taunting gesture? "Catch us if you can! ", is it? I take my cue from Boris Johnson, the Tory Mayor of London who, for a descendant of Turkish diplomats, is an exponent of all that it means to be British. Did you see him wave around the Olympic flag? Gordon Brown was caught laughing in his seat, undone with hysterics. It was awkward. And silly. And self-effacing. And proud-making. And so absolutely sweet. 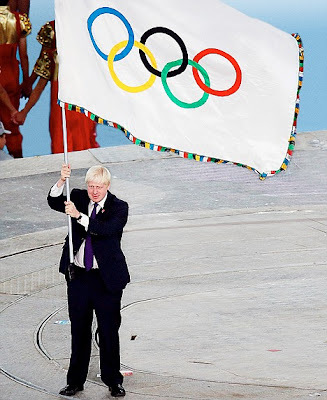 Watching BoJo wave around the Olympic flag with that ill-fitting suit showing a decidedly unathletic physique, you could almost forget the perfectionism that was the Beijing Olympics. Not a hair out of place, not a false step, or indeed, false teeth was allowed. That's not going to be the London Olympics, my friends. Boris Johnson is how it will look like. At once charming, and bumbling. It's what we do best. However, some people use this self-effacing incompetence for their own ends. The Left of every country takes a needling pride in bringing down their fellow countrymen, and sadly, our temperament provides no buffer against self-ridicule. That same intelligentsia today must be squirming to see our athletes having done so well in Beijing, and the rest of us so happy about it. Will we jingoistic vulgarians never learn? Apparently not. For no matter how often we are told that we're finished, that we're yesterday's colonialist oppressors and today's deadbeats, the British people will keep bouncing back. It must drive the contemptuous anti-patriots crackers. Of course, national pride doesn't mean we should lose sight of our many failings. The 2008 Olympics have been terrific for Britain, yes, but our filthy hospitals, failing schools, binge-drinking and spiralling street crime should certainly save us from any odious complacency. The Left's toxic self-loathing, however, is quite different from honest self- criticism, and it permeates our national life. You can hear it in Margaret Hodge's lofty sneering at the Proms, you can see it in the Royal Mint's removal of Britannia from our coins, you can discern it in the countless anecdotes of local councils demanding the removal of Union or St George's flags. But in the Beijing Olympics, this pernicious habit has met its match, and worse is yet to come, in 2012. ...you will see some strapping, delightful British athlete proudly waving that Union Jack behind him or her, having secured Gold for Britain. Now that we're freed to be proud of being athletic AND British again, we're going to be as self-effacing as ever, 4 years hence. Only this time, there will be a childlike sense of wonder at it all. Oh, and a fair bit of moaning, obviously. Some habits will never change. The Vice-Presidential nomination for the Democratic ticket has been much on my mind today. Already mainstream media are touting Joe Biden's role as the bulldog to Barack Obama's effete chihuahua. The Vice-Presidential nominee is there to attack, where it would be unseemly for the future President to do so, after all. That's nothing new. But just how much of a role is Joe Biden going to play in an Obama presidency? Well, first order of business is, do not overshadow The One on the official campaign poster. At first, when I posted the website announcement below, I thought, well, this Obama-Biden graphic looks a bit hurried. But after all, it's early days. They will surely trot out a more professional-looking graphic in the coming hours. To my shock, though, during the presentation rally in Springfield, Illinois, the posters had the same image. 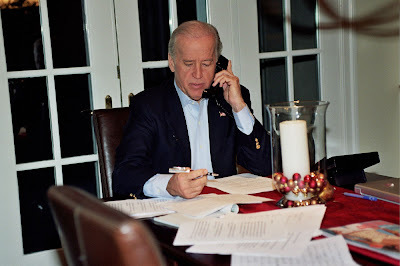 Notice how "Obama" is starkly white, whereas "Biden" is shown in lacklustre greyed-out lettering. You can really see what I mean in the photographs of the rally. Though Biden doesn't have a Clintonesque ego, let alone an Obaman one, he is a man with pugnacious touchiness, and he's not above putting some poor schmoe down publicly. I wonder if he has realised just how much of a second banana he is going to be, especially after Michelle and others are factored in? Because, if the ticket is elected, this is how it will look like after he's done his bit in November. Just fair warning, Joe. There's no room for another One in Obama Nation. In what will be called the "midnight announcement", the official Barack Obama website makes it official. His running mate will be Senator Joseph Biden of Delaware. - Foreign policy experience. Senator Joe Biden owes President Saakishvili a fruit basket, though. - Roman Catholic. Democrats cannot win without that demographic, though how much of a help that is directly, is to be seen. - "Working class". Well, as working-class as a 6th term Washington Senator can be. - Solid family man, once widowered under tragic circumstances. His wife, Jill, is an educator. - Son, Joseph "Beau" Biden III, in the Delaware National Guard JAG Corps, and Attorney-General of the State. - They have good chemistry together. Like many others, I've observed them in the past. - Twice ran unsuccessfully for President, as recently as January 2008. - He voted for the war in Iraq. He then didn't back the Surge, choosing a tepid "third way". - The Pumas will still be livid it's not Hillary. - As much as a Gaffe-O-Matic as Obama, if not more. - Has been accused of plagiarism in the past. - His father might've been a car salesman, and he might be from scrappy Scranton, Pa. but he doesn't give off any working-class vibes. - Doesn't help Obama regionally. - Glib. Once said of Rudolph Giuliani: "There's only three things he mentions in a sentence: a noun, and a verb and 9/11." - Male voters; Catholics; Lunchbucket or Reagan Democrats; Baby Boomers. - Recreational Drug Users (was the Senator behind the RAVE Act, and instrumental force behind the "Drug Czar" position); the Youth Vote; Southerners. Some women (however, is a strong advocate against domestic violence); Jewish voters (is pro-Israeli); the military. There are 6 letters in Joseph. And 6 in Barack. There are equally 5 letters in Biden. And 5 in Obama. The strongest possible running-mate, no matter what the extreme Left-wing of the Party say, is still Hillary Clinton. That choice was not possible, for a myriad of reasons, so Senator Obama went with the second-strongest candidate. I happen to think it's a good choice, even a canny one, but for a candidate as singular to the process as Obama has been, there are very few enthusiasm points generated with this pick. Biden is vanilla to Obama's 31 Flavours. Will their ticket still have "Change we can believe in" as the slogan? Or will they have to alter it to "Keep the change"? Joe Biden -- Not Hollywood's Pick? Oops! I meant, Obama Bin Biden. See what the Obama-Biden bumper sticker might look like. But I have no idea what brought on my brainfart. 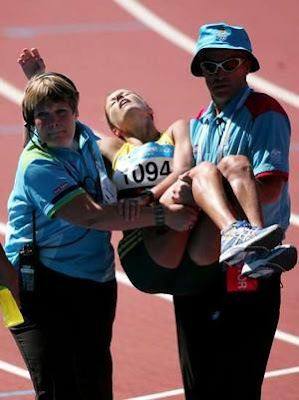 The adorable 5'3" sprinter from the University of Miami, Lauryn Williams, failed yet again in the women's 4x100m relay race, when she and Torri Edwards bobbled the baton. Afterwards, with crackling voice, told the NBC reporter, "Someone must have a voodoo doll of me". And speaking of Jamaica, can we send Tropical Storm Fay there? Maybe then she'd learn how to haul arse quicker out of Florida. Jeez. 20-30 inches so far. That's Noah's Ark proportions. Still, considering all the catastrophes around the Olympics, at least we're not this poor Hungarian weightlifter, much the worse for wear after his lift. DO NOT VIEW IF YOU'RE SQUEAMISH. Yeah, I know. Romanian gypsy curse. UPDATE: Over at Althouse, the blogger uses a word called "sledgehammer" when she wishes to cudgel her commenters over the head with a point they obviously didn't get. Do not ever show your country, through your comments, in anything but a positive light. When you wilfully misunderstand a post, due to oversentimental nationalism, due to being the underdog the whole of your life, and see insults were NONE were given in earnest, you look stupid, and worst of all, Third Worldish. That is unforgiveable. You will never be taken seriously as a nation, if you do that. Touchiness is for losers. So do not come to this blog and let down your side here. I refuse to let you embarrass your countrymen in any way. Mr. President, Thank You For Your Inspiration! "Thank you for your support, thanks for everything you do." 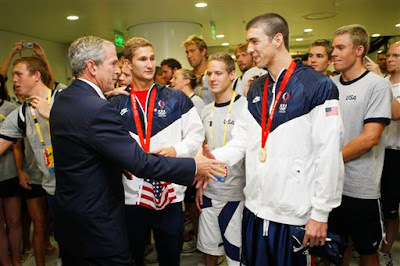 Kerri Walsh's shout out moments ago, alongside her partner Misty May-Treanor (married to Florida Marlins' catcher, Matt Treanor) to the sitting US President, George W. Bush. They had just won the Gold Medal match. You could've knocked me down with a feather. When was the last time you EVER heard George Bush mentioned by an American abroad in these positive terms? I’m afraid too many idiots in the country will read “Obama - Biden” and think it rhymes too much with Osama Bin Laden. Oh dear! Sounds like a Rodgers and Hammerstein ditty. Obama's been busy as a bee. 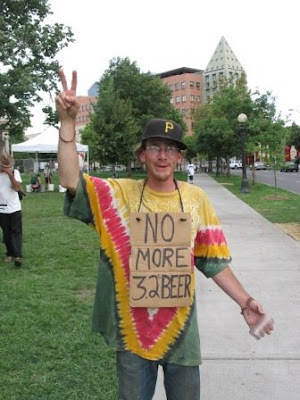 Biden's number 2 or number 3. ...that will bring us back to Hillary!". A relatively underreported quasi-debate between the two presumed candidates for the Presidency took place on Saturday. It was so refreshing to see this forum, that one almost forgot this was an important political stop in a campaign that has stalled nationally since Senator Clinton declared defeat. For almost 3 months afterwards, we've only had national ads as our lone chance to compare candidates directly, plus a foreign tour where one candidate decided he'd rather court plaudits in Berlin than in America. Frankly, I was wondering when the campaign would begin in earnest, and I'm happy to say, it finally began on Saturday. Those of you who watched this forum already know that Senator John McCain impressed. He is not a religious man, nor is he particularly an evangelical-approved Conservative Republican. But in his rapid-fire responses, Americans once again heard what a relaxed Commander-in-Chief would sound like -- and not an embattled, defensive man always thinking two steps ahead to the inevitable gotcha question like President Bush has sounded for, oh, about 7 years now. Actually, as I was composing this post about the Saddleback forum, I was suddenly reminded I had seen a very similar performance from President Bush, and it wasn't dated sometime in early 2001. Moreover, it was a performance which showed him earnest, affable, answering questions without a single hesitation or mangled sentence, and further, had been full of probing questions -- but lacking in the usual tense animosity towards him. It was none other than at the NBC studios with Bob Costas, sports geek extraordinare, having a 3 minute chat with President Bush during the a break in the Beijing Olympics coverage. Don't take my word for it. Here it is below. If McCain hit a grand slam at Saddleback, it can be said that Bush got on base, and even stole 2nd when they least expected him to. I can't recall when there was such a fantastic week for Republicans, as this mid-week boon in August '08. It may be the most significant moment before the Democratic Convention, which promises to be more controversial than anything the Olympics have coughed up so far. As I tuned into MSNBC just now, David Shuster revealed that Senator Obama has been gunning his campaign ads in the State of Florida. "Tens of thousands of ads", is how Shuster put it. And then he cited the Wall Street Journal's claim that Senator McCain has counterpunched with this number of campaign ads in the whole State of Florida. Are you ready for the number? By merest coincidence, I've taken it on myself to keep mental track of the ads I have watched on NBC Channel 6, the local NBC affiliate, especially during prime-time. I've regularly been posting the updates on Althouse about this very topic, just as a curio for the commenters there. Wondering out loud, I asked if they could post their own tallies, because of the McCain-to-Obama ad imbalance, my question is, since we are receiving the national NBC feed at times, does each State nevertheless get more local coverage for the ads? In other words, are we in South Florida being comparatively saturated with McCain ads, and not Obama ads, due to some campaign strategy or are all Americans getting the ads at the same time? I am now very glad I noted the times of the two ads I saw, before turning in. The last McCain ad I saw was at EXACTLY 2:21 AM, early Tuesday. The last Obama ad was around 20 minutes later, at around 2:40 AM. Those of you with TiVo of the Games in South Florida, do us all a favour and get that on Youtube. I have no earthly idea where MSNBC or the Wall Street Journal are getting their stats, but it was irresponsible of MSNBC to broadcast this news without making at least a cursory search online to see if anyone was keeping track. They would've seen my posts, at once. Why would MSNBC gleefully report this news? Because they wish to reiterate that McCain is so incompetent that his camp do not even care to target Florida, a crucial swing State, with their ads. "Is he mad??". No, MSNBC. Some of us are keeping tabs. Sorry to burst your Obama-tingle bubble, but actually your chap is running behind a 72-year old man in this ad race, so far. That just makes others want to mimic their sing-song languages, or make references to their narrow eyelids. Who can forget Brazil soccer super-star, Ronaldo, arriving in Seoul greeting his hosts with this tell-tale gesture. 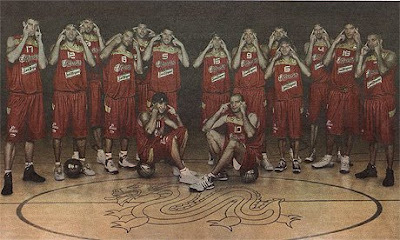 And via JSU, comes word that the ENTIRE Spain basketball team decided to pose like this, ahead of their Olympic voyage to Beijing. From Prince Philip telling a British student studying in China that "stay here long enough, and you'll get slitty eyes" to Rosie O'Donnell's infamous "ching-chong" insult, there's something about Easterners that just makes Westerners' funny bones go into overdrive. 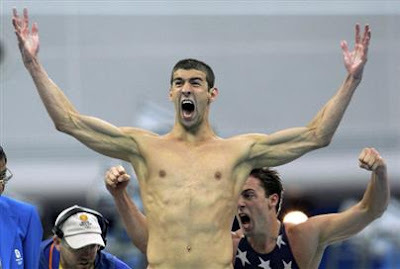 And I kept screaming my fool head off as I watched Michael Phelps celebrate Jason Lezak's stunning victory over the arrogant France team, with every fibre of his body. Have you also noted that wherever this guy has gone to meet US Olympic athletes, he's brought them luck? Maybe he should be like President Chirac, and be made the unofficial mascot. *Please note that my condo's President is French, and the building is FULL of his countrymen. Seriously, on my floor alone, we have 3 French couples including a very nasty one which left a taunting note pinned on our door, after England crashed out of World Cup 2006. Don't worry. I won't return the favour tonight. I may be as arrogant as they are, but I for one, am bien elevée. UPDATE: The surprising medal count so far, as of time of posting. ...is that he's not Ian Thorpe. He might remind one of John Kerry, and being the Beijing Olympics Hero is not exactly Americans-eyeball grabbing stuff, but at least the Japanese will not be invading our shores, because they are Phelps-mad like they were with the Thorpedo. Thorpe's popularity in Japan soared after the Sydney Olympics. But it was last year's Pan Pacs at Fukuoka, in southern Japan - where he swept the pool with six gold medals - that secured his superstardom. Beyond his success and personality, his oft-professed affection for Japan is also part of his popularity there. Why does every gay icon get such a cult following amongst the Japanese? Should David Beckham be worried? Incidentally, sorry I haven't updated the Opening Ceremonies blogpost. I am one of the very very few people on earth that didn't much care for it. What was the bagpipe music all about? I cannot live-blog them as anticipated, but let this post be a placeholder for my later thoughts. Ooh, is that the Chinese National Anthem? It sounds...undeniably Communist. But oh well, all national anthems are beautiful. More later! 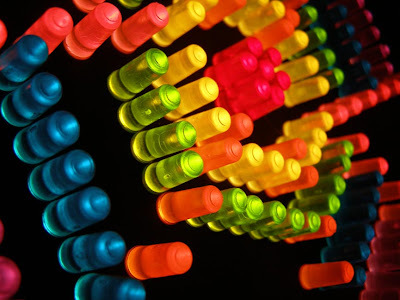 UPDATE: Welcome to the Lite-Brite Olympics! I am taking a leaf from my Eurotrash background, and taking it easy in August. Quite sure I'll be on Sundries to Fisk the Opening Ceremonies for the Beijing Olympics, as I did for Torino, but I'm concentrating on my athletic hobby at present, so blogging will be light. Just to remind us what to expect, comes this blogpost entry from British journalist-marathoner, Tom Fordyce. I heard him on NPR's The World today. 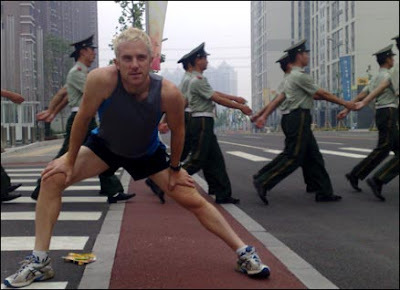 He tried to recreate the experience of what those brave men and women will do in Beijing -- run the marathon in perhaps the most ghastly polluted city in the world, save Cairo. Here's an excerpt (warning: not for the faint of heart, or those unused to hearing vivid accounts of spitting). Don't worry about the pollution, the Beijing authorities have been telling us. Factories will shut down. Cars will be taken off the roads. Skies will be seeded with silver nitrate and clouds conjured away to leave the air perfect for the world's athletes. That's the theory. Happy to lay my lungs on the line in the name of unscientific research, I decide to head out into the city on a long run to test conditions first-hand. The initial signs are disconcerting. As I jog down the stairs and out into Monday morning, the concrete tower-blocks of the Green Homeland Media Village are shrouded in what looks like a heavy autumnal fog. Even with the sun completely hidden away in the grey blanket up above, the heat is intense. Traffic is roaring by on the Beiyuan Lu expressway, soldiers in pale khaki shirts and white gloves marching in rectangles around the security barriers. I wave at a group of staring schoolkids and head south towards the Olympic Green. Five minutes down the road, my t-shirt is already drenched, hanging heavy off my shoulders. It's 9am. At this time of day, the Olympic marathon runners will still have seven or eight miles to go. The triathletes won't even be starting the run leg of their races for another three hours. I pass a woman whose mobile has an Axel F ring-tone and realise that my throat has started to feel sore, as if I had a cold coming on. Maybe it's the road I'm running alongside, I think, and head down a side-street in search of a patch of greenery. Another five minutes down the line, there's a strange lumpy feeling halfway down my throat. An old chap watering a freshly-planted verge hawks up a fat lump of phlegm and flobs it expertly into a plant-pot. When in Rome, I think, and spit into the gutter with relish. The metallic taste in my mouth remains. It's not easy working out where to go. The haze obscures anything more than 100m away. I've picked a bad day - today the BBC reading registers 292 micrograms of particulate matter per cubic metre (the World Health Organisation target is 50). I'd planned to aim for the Bird's Nest Stadium 5km away, but there's as much chance of me spotting it in these conditions as there is of me doing the pole vault there in 10 days' time. The road stretches into the gloom, the two dedicated Olympic lanes completely empty of traffic while buses and bikes fight for position in the other lane. "One world, one dream," read the banners flapping from the lamp-posts. My map shows a large park off to the left, but everywhere you look are tall fences and short officials with strict instructions to keep you out. At the halfway stage, my eyes have started to feel gritty, as if I'd been out all night in a club full of smokers. Three weary-looking blokes slumped on a bench ni-hao in my direction as I rub my eyes and I ni-hao back. The stinging in my throat gets worse as I head back north, the Bird's Nest lost somewhere in the smog. Towers of apartment blocks loom slowly out of the mist. Young blokes on mountain-bikes pedal past while shouting into mobiles, which at least makes me feel more at home. Every now and then a solitary soldier stands on a small plinth, staring into a seemingly random direction with a blank expression. My lungs feel half their normal size. No wonder an asthma sufferer like Haile Gebrselassie decided to sack off the Olympic marathon, even though he's the world record holder. The only other time my lungs have felt this bad was when I got stuck behind a brigade of belching buses while foolishly cycling down Oxford Street. By the final few miles I'm dragging my legs along like sandbags. There could be several reasons for that - seven hours of jet-lag, the cannonball-like lump of egg-fried rice lodged halfway down my digestive tract, a delusional attitude towards my own fitness - but I've also taken it incredibly easy. How much worse would I be feeling if I'd really opened the lungs up and got my heart-rate going? At the end I'm coughing like a 20-a-day man. It's like I've borrowed the lungs of my colleague Ben Dirs - and if you've ever seen Dirsy trying to walk up a flight of stairs, you'd know that's a very bad thing indeed. Goodness. What kind of sport have I gotten myself into? Tiny Tim meets err, Abbie Hoffman? 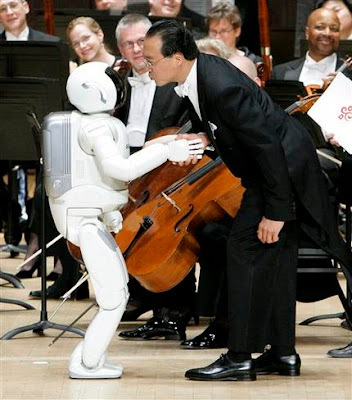 The very rare robot cello competition will make its Olympic debut this August! Are you excited about the Olympics, yet? I had made an impromptu request over at Althouse regarding running shoes. I received a comparative avalanche of replies! I'd like to thank some of those who each told me the exact same thing: head to this or that (online) shop. Paddy O, Dog Wood, Hoosier Daddy, thanks for the advice! I know José is a jogger, but I'm more interested in long distance running for next year. My dream has always been to enter the Flora London Marathon, ever since a cousin of mine did it for charity (she finished very decently, timewise, at that). Let's see if I can't top that, one day! Thanks for any tips, either for running, workouts, or tennis.